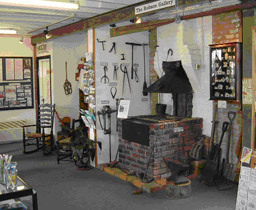 The Heritage Centre stands in the Centre of the Old Town in the old Smithy. Along with many other buildings in the Old Town the Smithy was purchased by the Borough Council many years ago with a view to a development which never took place and it was allowed to fall into disrepair until the Leigh Society formed and decided to rescue the building. Over the centuries the building had been owned by several people and used for a variety of uses. After the formation of the Leigh Society in 1972, meetings were held in the front rooms of local residents including the late David Atkinson, later MP for Bournemouth East, John Pettit in his antique shop on Leigh Hill, Cllr Grace Robson and others. Grace bought a folding office and kept all our files in her front room on New Road. 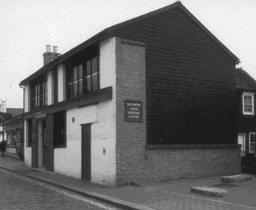 In 1979, Southend Council was approached for a lease on any suitable building, and that was how Ron Foyster, former Council Engineer for Canvey Island and Chairman of the Society at that time, decided that the Smithy building in Leigh Old Town, two old cottages numbered 13A, could be saved. We had eight weeks to make it safe and get a demolition order withdrawn. It was clear to the Society that this building was important both as a Heritage Centre museum, and for its pivotal position in the High Street. Ron obtained some Acrow props to hold up the dangerous sagging building that was stuffed to the ceiling with scrap metal from the engineering shed on Strand Wharf, and a working party was set up and removed about seven tons of metal from the building. A scheme of temporary support was agreed, and the building made safe at the end of 1979 by a local builder. 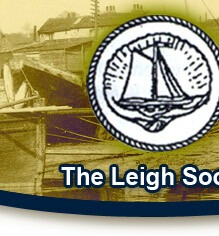 The Leigh Society won first prize in the 1980 Essex County Council Amenity Societies Scheme for conservation work. In 1980-1 the Society promoted fund raising schemes for the restoration. Approaches were made to the Department of the Environment, the Manpower Services Commission, Southend Borough Council and various charitable trusts. In 1981 the Society submitted a detailed estimate, based on plans drawn by the Moss Prime Coombs architectural practice, for a Heritage Centre, to the MSC under their Community Enterprise Programme.